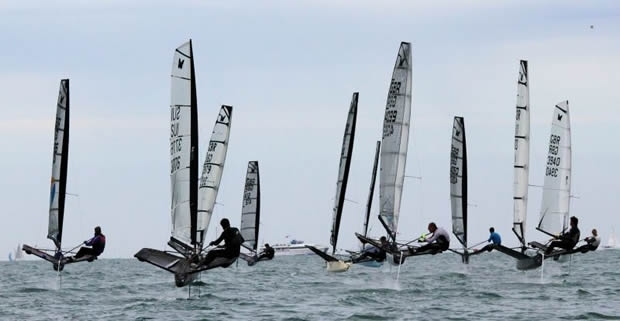 The final day didn't provide the glamorous conditions of the previous two days, but the Stokes Bay Race Team, led by Principal Race Officer Mike Rayden, managed to complete the full series in marginal foiling conditions. With Chris Rashley clearly out in front, the battle for second place overall was hot - just six points separated 5 boats going into the final day. In the end Ben Paton just pipped Jason Belben thanks to a third place in the final race. The pair ended equal on points but Paton's greater number of second place results gave him the runners-up spot on the podium. Paton was focused today and blitzed off the line to lead half of the first race, only for Rashley to overhaul him on the second lap. He said after the racing: "I had a tricky start to the event, two discards in my first two races, so I felt a bit under pressure but it made me work really hard and I was really pleased to go out today and do what I did. I wasn't always in a strong position around the windward mark but I managed to fight, even though my legs and arms were in absolute agony. I managed a third in the final race which I'm really pleased about." Jason Belben was pragmatic about losing out to Paton on count-back, "I thought it was going to be difficult today and I went out there with a positive attitude, but I was very pleased with what I came back with to be honest. The first two races today I was really chuffed with and I only messed up the last one unfortunately. I think the event has gone very well, we've managed to get 12 races in and they've been good, solid races. The weather's been ideal, we couldn't have wished for more." Belben said on Ronstan's sponsorship of the event, "The Ronstan product suits the Moth ideally so we're always going to be involved with these sort of events." The fleet has gone through a lot since the Moth Nationals were last held at Stokes Bay and Jason reflected on the quality of the racing throughout the fleet, "I think if you compare it to last time we were here, which was about four years ago, there was a big spread then, but you can see how the whole boat has developed and the people sailing it have got used to waves and everyone's come closer together and we're all using similar equipment now. There's not a lot of difference in boat speed now." Chris Rashley continued his blistering form to make it 11 wins from 12 races, with just the slight blemish of his second place in race 1, but with two discards in the event he was still discarding a 1st place. He said after racing, "It feels great, when I came into the regatta I felt I was going to be really pushed to win the event, but I went out there to try and keep it simple and ended up coming through to the front by the end of most of the races." The next regatta for Rashley and a number of the British sailors is the European Championship in Holland. Rashley, who has won the Europeans title four times, said: "It's a big event for me to try and win it five times, I'm pretty sure it hasn't been done before from looking at the trophy at home. It'll be a big challenge for me to try and win that but at the same time I think you've got to be realistic, everyone's working really hard and people will be getting better and certainly catching me at this event. There's a few things going on in development at the moment which will hopefully give me a little bit of a gain in the next month to six weeks but that's really all the time I've got before the event. It's a little bit last-minute but I'm just going to rely on my sailing ability to pull me through." Worldwide, the antipodeans still hold the upper hand, with a Pete Burling master-class at the 2015 Worlds in Sorrento. Rashley said on closing the gap: "If there's one thing I've learnt about Moth sailing it's about how good people are at keeping the boat going at 95 to 100% of its capability whilst racing and Pete is incredible at that, he shows that in the 49er and he shows that in anything else he's touched really. He's extremely good at keeping the boat in the groove and when I sailed against him in the worlds he was in a different league to me. I had some issues during the worlds and I think I would have been a little bit closer had we been racing each other this week, and I would have like to have thought I could have taken a few races off him, but he's a long way ahead of everyone else." Ricky Tagg and Graham Simmonds, who have done a lot organising events for the UK Moth class, reflected on a successful championship. Tagg said, "I think overall it's been a very good event, it's great that we got all the scheduled races in. We've had winds from marginal foiling to good solid breeze with waves, so I think anybody who wins here or does well is truly worthy of the title, bearing in mind the different conditions we've had to contend with." On the quality of the UK fleet he added "There have been a number of innovations over the last two to three years which have percolated all the way down the fleet, so people now have the relevant controls, which means that everyone can race the boat harder. People are practicing more and you're seeing much tighter racing throughout the fleet - everybody's racing rather than just trying to stay on the boat." Simmonds commented: "I think the main difference in the two and a half years is we've had a shift away from Australian-based development to UK-based development, obviously with the introduction of the Maguire Exocet, which is now competitive in all conditions." At the prize-giving, the competitors and organisers thanked the race committee, club staff, catering staff, bar staff and the sponsors who have kindly supported this event; Noble Marine, Ronstan and Blueteq.